If anyone is lucky enough to be in Central Asia once, he or she will forever remember fabrics with surprisingly bright, rainbow transitions. Hundreds of fabrics have been excavated in Central Asia since the late nineteenth century. Fabrics of Chinese, Iranian and Central Asian manufacture from the great period of the Silk Road, the first century BC to the eight century AD, were discovered in the early twentieth-century excavations at various Central Asian sites. There has been a recent find of an ikat fragment, about four to five inches square (10-12cm), with a woodgrain-like pattern in silvery gray and beige from the forth-to-ninth-century site of Astana in Xinjiang Province, China. This as yet unpublished fragment appears to be the only ikat from an archeological site anywhere in Central Asia. The other surviving examples of what may be ancient Central Asian ikat were found not in Central Asia, but in Japan. A small panel of all-silk warp ikat was preserved for centuries in the Horiyu-ji Temple repository in Nara. 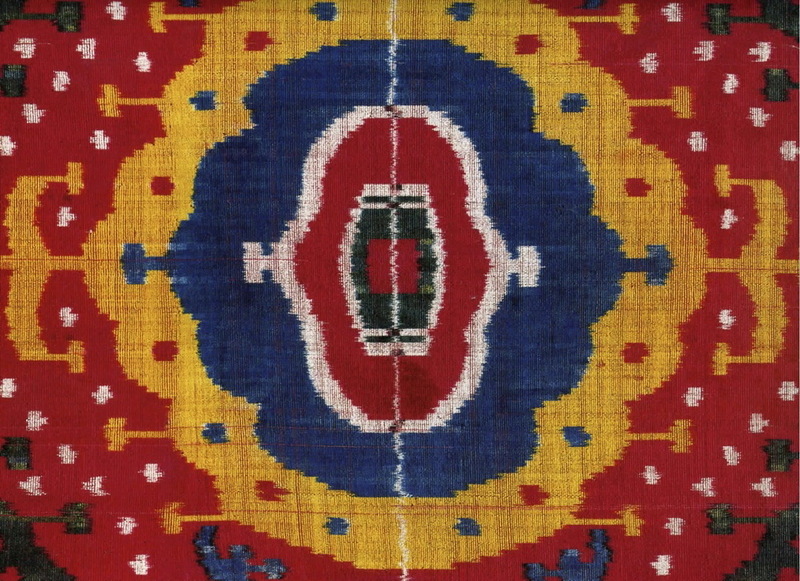 Its identification as Central Asian has largely been based on the elimination of any other possible source of origin, and on parallels in design and technique with modern Central Asian ikat materials. The ancient fragment has rich, vibrant colors and a bold abstract design; it was a highly valued object that was used as the centerpiece of a banner, and carefully preserved for a thousand years. Several authors have nominated Central Asia as the area responsible for the origin and transfer of the ikat dyeing method. It seems more likely that the ikat technique evolved independently in a number of areas. Until the nineteenth century, ikat weaving appears to have remained a relatively minor element within a far larger tradition. The ikat is one of the business cards of the ancient and mysterious East, a beautiful and really interesting souvenir, for which today there is no need to go to distant countries. 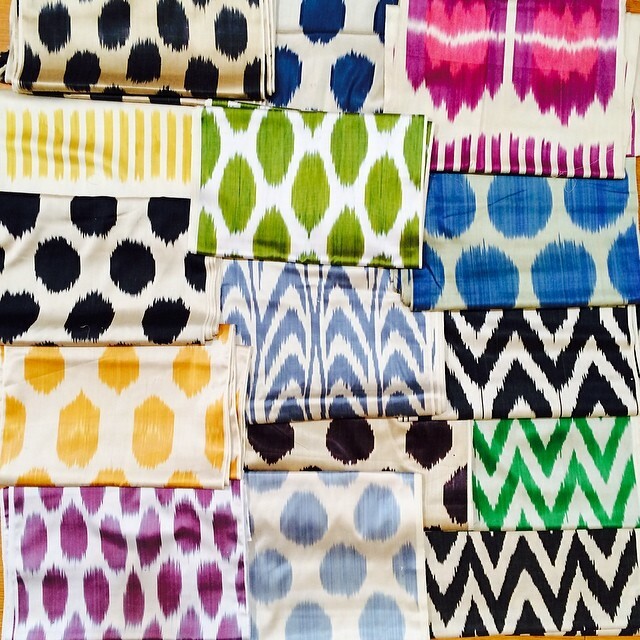 The term ikat means both the fabric itself and the method of its manufacture. The originality of the ikat consists in the fact that the threads are first painted, and then get into the loom, and all the magnificence of this beautiful product can be enjoyed only after it is ready. Ikat can be compared with jazz improvisation, when new themes are woven into the background of well-known melodies, sometimes changing the basic outline of the work beyond recognition, filling it with other colors. Ikat is a stylish pattern of one master with a known geometry to him alone, in which lines and colors intricately intertwine, giving rise to the intricacies of images and shapes. Ikat is sometimes called by another name – khan-atlas, adras, Bukhara shoi. Its production during the Soviet era was concentrated in the small town of Margilan. There is an interesting legend about the Khan Atlas explaining its rainbow colors. One artist did not want to give his beautiful daughter for the old but rich ruler of the city and grieved at the stream. In the water, he saw the rainbow fluttering from the breeze, the picture struck him so much that he transferred it to the fabric. So what happened to his daughter? She got married! She married the beautiful son of the ruler of Margilan and lived with him a long, happy life. Historians studying the origin of textiles cannot agree on where the ikat originated? Some consider that its birthplace is southern China, others argue that it happened in India. The old ikats found during excavations in these countries are quite unlike the Central Asian ones. Researchers are united in one thing – the Great Silk Road was the driving force, and provided an opportunity to develop such an excellent kind of craft. In the exposition of the Japanese temple Horyu-ji can be seen fragments of tissue brought from China in the VI-VII centuries, very similar to Bukhara ikats. Among the heritage of the old Indian masters in the set there are fabrics made by similar technology, but the ornaments contain elements typical for India – elephants, figures of dancing girls, flowers. It can be said with confidence that the method of dyeing the threads with a bundle was invented in the 5th-7th centuries. Where? It remains a mystery. Central Asia lies just in the middle of the Great Silk Road, having access to silks and bright dyes, artisans began to produce fabrics that still amaze with the highest quality and brilliant colors. The earliest documents confirming the presence of Central Asian ikats belong to the 18th century, and to the 19th century, when this distinctive type of folk art flourished, which glorified it to the whole world. Due to an unusual design, ikat can be named as the most distinct fabric produced in Central Asia. Phyllis Ackerman has suggested Central Asia as the point of origin for the technique based on the use of the Turkic word alacha for ikat in both India and Iran, however, this word refers not only to ikat but to striped fabrics made in a variety of techniques. In essence, the Central Asian ikats were a commercial art-form that transcended the limitations of the marketplace. Their inventive pattern and explosive color needed no interpreter – ikats traveled across the steppes as booty, as trade goods, and as gifts of robes of honor from proud Khans to the great Tsar. The color transitions in the early Ikats are sharply different, after the craftsmen mastered the production technique well and they became smoother. Figures partially repeated traditional, but in a different interpretation. 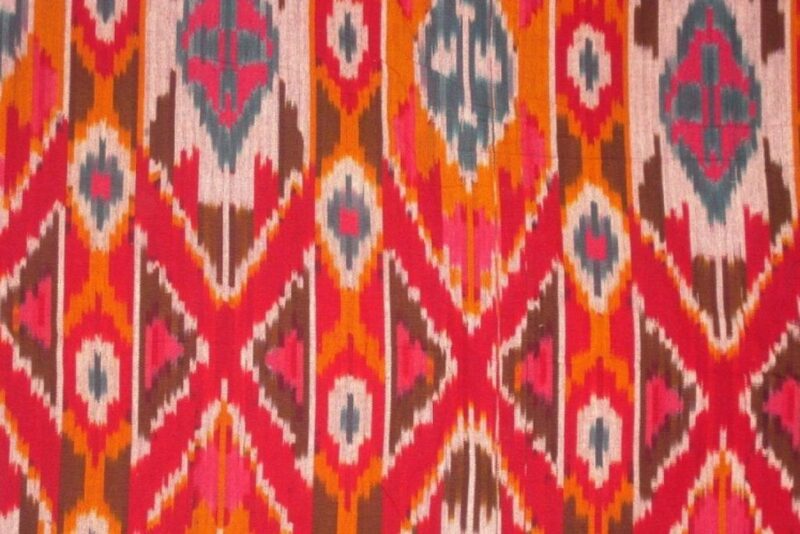 According to one of the versions, the technology of ikat production was brought to Bukhara by the Iranians who had fled from Merv, and then it was seized by artisans of Samarkand and the Fergana Valley. There is another theory according to which ikats originated in the territory of present-day Central Asia, many ornamental trends and well equipped workshops for silk dyeing and fabric production speak in favor of this position, however, there are very few documentary sources confirming this point of view. The arrival of Soviet power in the Central Asian republics is marked by the decline of the original craft. At the beginning of the 20th century, the flow of factory goods that flooded the Uzbek, Tajik and Turkmen markets from Russia made the artisanal production of fabrics unprofitable and it gradually faded away. Recently, interest in the original Oriental culture has increased many times and as it’s well known, demand generates supply. Today, ikat plays a key role in all the fashion festivals of Central Asia. There is no any museum of decorative applied art, the exposition of which would not include a section on the history of fabric production. It is actively used by designers for filling interiors and not only eastern ones. Ikat is music for the eyes, becoming the happy owner of a true masterpiece with a rich history, you fill your house with oriental exotics, hot breath of the desert, bright colors of the oasis, intoxicating sweetness of rakhat-lukum, aroma of fragrant plov. This entry was posted in Home + Decor, ikat fabric. Bookmark the permalink.